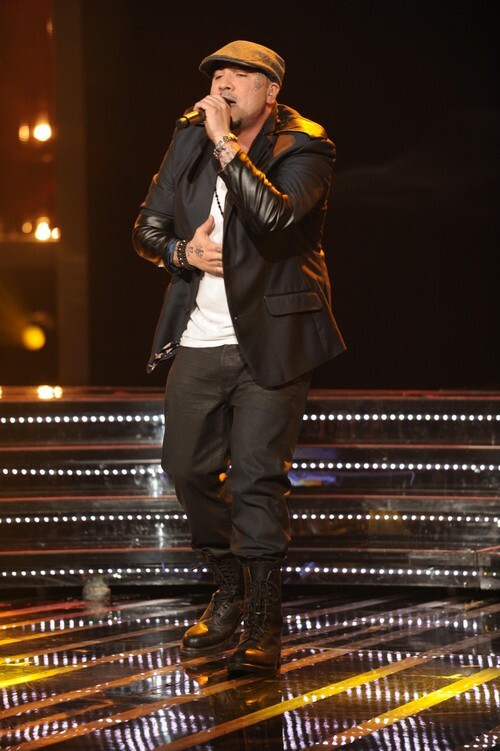 Vino Alan took the stage tonight on THE X FACTOR USA for his Top 10 video performance. Vino Alan sang “You’ve Lost That Lovin’ Feeling” by The Righteous Brothers. Tonight’s show the top 8 performed live in front of coaches Simon Cowell, Britney Spears, Demi Lovato and AJ Reid for America’s vote and to make it another week. This week on THE X FACTOR, the Top 8 will perform songs that hit Number One on the charts. Did you miss tonight’s episode? If you did we watched it and we recapped it here for you. Judges’ Comments: Vino Alan has struggled this week in rehearsals and changed songs at least once. His version of You’ve Lost That Lovin’ Feelin’ really suits him but I’m still not a fan. He sounds really good so I have no idea why I just can’t invest in Vino, but clearly I seem to be in the minority. Okay, Britney agrees with me because she feels like it’s the same thing each week- and Demi agrees. Simon wanted it to all end by the halfway point. On tomorrow’s result show, don’t miss performances by Grammy Award-winning R&B singer/songwriter Alicia Keys, and Josh Krajcik, a finalist on last season’s THE X FACTOR. Then, Khloé and Mario will announce the acts that made the cut in an all-new “Live Results” episode. Check out the video below and let us know what you thought of Vino’s performance? Was it enough for Vino to make it through for another week? Sound out in the comments below and let us know your thoughts.